He is currently standing at stud for 2014. His current stud fee is $500. He has Live Foal Guarantee. His pedigree includes: Hide-A-Way's Firefly Supreme, Desert Supreme Memories, Desert Supreme Admiral, Courageous Admiral, Wing's Fleet Admiral, Sultan's Santana, Copper Coin's Commander In Chief, Wing Commander, Denmark's Pretend, and Pinetree Denmark. He has a line going directly back to Stonewall King, Society Rex, and 5 broodmare hall fames. High Point's Ivory Coast is double dilute for the cream gene. 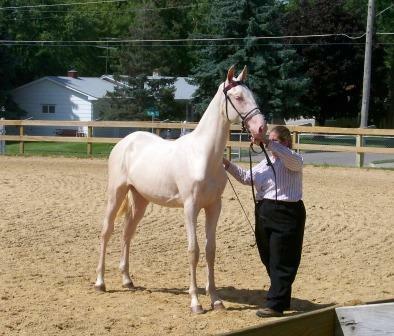 He will be 100% color producer of Palomino, Buckskin, Smokey Black, Perlino, Cremello, and Smokey Cream. Which one of these color he produces will depend on the mare's color genetics. The link below is to a equine color calculator to let you know what your possiblities are. Ivan at his first horse show, The Great River Benefit Saddlebred Show in Cedar Rapids, IA. He placed 4th against more experience Saddlebreds. We showed High Point's Ivory Coast in the 2009 QCABHA Futurity and Open Show. 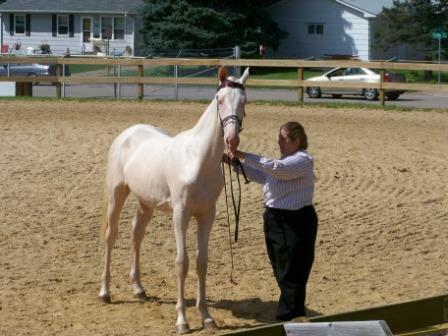 He placed 3rd in a huge yearling class of a variety of breeds (Quarter Horse, Paint Horse, Arabians, etc...). He received two 5th places in 2 and under halter and Light Horse Halter. Both classes were good size. He received a lot of nice comments from the audience including how big is going to get? To see more pictures of High Point's Ivory Caost check-out the photo gallery, especially the pictures by RA Images.